We have reported few times before about how the Apple iPad helps with learning and education and how different schools are giving and allowing iPads to be using by students. Well a School district in Calumet Michigan is now allowing it's 4th through 12th grade students to have iPads in the classroom and around the school. It's all part of a new imitative to promote student learning and advancement. The state used stimulus money to pay for the iPads in an effort to advance technology in it's schools. Students will now have their homework right at their fingertips and they will also be able to stay up to date on the latest information. 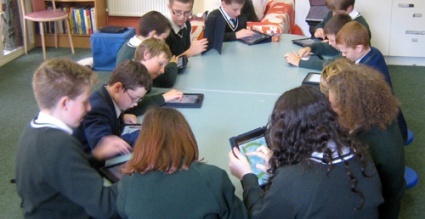 The 4th and 5th grade students will leave the iPads in the classroom but grade 6 through 12 will be able to take them outside the classroom and school grounds. Email, textbooks, and educational games are all applications installed on each iPad, that means no Facebook or other social networking sites. But this doesn't seem to bother most students, in fact they say they are excited to have a lighter backpack and easier access to homework. The school officials hopes the latest Apple gadget will keep students informed in and outside the classroom. Note : The Free Offers listed for Free Digital Reader and Free Digital Tablet Giveaways are for United States ( US ) Residents only! So if you live in Alabama, Alaska, Arizona, Arkansas, California, Colorado, Connecticut, Delaware, Florida, Georgia, Hawaii, Idaho, Illinois, Indiana, Iowa, Kansas, Kentucky, Louisiana, Maine, Maryland, Massachusetts, Michigan, Minnesota, Mississippi, Missouri, Montana, Nebraska, Nevada, New Hampshire, New Jersey, New Mexico, New York, North Carolina, North Dakota, Ohio, Oklahoma, Oregon, Pennsylvania, Rhode Island, South Carolina, South Dakota, Tennessee, Texas, Utah, Vermont, Virginia, Washington, West Virginia, Wisconsin, and Wyoming you are eligible to Enter Free.